The long-awaited Gambling Bill paving the way for new casinos across the UK has been published by the government. The new law, if approved by Parliament, will allow casinos with up to 1,250 slot machines and unlimited jackpots. 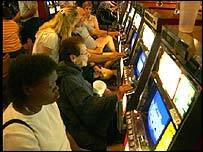 It would ban slot machines from fast food outlets and minicab offices, restrict internet gaming and introduce a new industry regulator. But opponents, including the Salvation Army, say the bill will lead to an explosion in problem gambling. The Gambling Bill is to be fast-tracked through Parliament so it will become law before next year's expected general election. Britain currently has 126 casinos with slot machine jackpots limited to £2,000. But US companies including MGM Mirage and Caesar's Palace already have plans to develop a string of large casinos with up to 1,250 machines, some offering £1m prizes. Former welfare minister Frank Field has warned there would be "no turning back" once the door had been opened to such operators. The Salvation Army is concerned that there is nothing to prevent casino operators from offering local councils an annual percentage of their profits in return for planning permission. Spokesman Jonathan Lomax told the London Evening Standard: "Local authorities will have to make important decisions about where to site potential casinos and it would severely impair their impartiality if significant amounts of money were being offered in return for licences." It has also claimed the proposals will lead to more problem gambling. "There are only two real winners that will benefit from the liberalisation of gambling laws: the gaming industry through massively increased profits, and the government through increased taxation. "The big losers will be the vulnerable people whose lives are ruined by gambling addiction," a Salvation Army spokesman said. Ministers insist new safeguards will protect people most at risk from addiction. The Bill removes limits on the number of casinos allowed to operate, but at the same time will put in place more restrictions on granting a licence. The new regulator, the Gambling Commission, will also monitor levels of problem gambling and the industry will have to pay £3m a year towards research into addiction. The regulator will also have new controls over the way gaming machines operate, including speed of play, near misses and making information on losses clearer to players. Secretary of State for Culture, Media and Sport Tessa Jowell said new legislation was needed to keep pace with technology. Tom Kavanagh, secretary of the Gaming Board of Great Britain, answered your questions on the Bill. "Levels of problem gambling are low in Britain and I am totally committed to keeping it that way. That's why the Bill is so important." "With a powerful new Gambling Commission policing these rules I'm confident the UK will become the safest gambling environment in the world." Ms Jowell said the legislation was about "new protections, not new casinos". The current law "leaves people vulnerable," she argued, which was why new legislation was needed. "But we also have to recognise that gambling is a popular leisure activity enjoyed by millions of people," she added. "Adults need to be treated as grown ups and allowed to choose what they do in their leisure time." The minister responsible for the bill, Lord McIntosh, said casino operators would be forced to provide "benefits for local people", such as "social housing, new roads and entertainment facilities". "There is no question of Las Vegas being opened in Leicester, or anywhere else in this country," he told BBC Radio 4's Today programme. If the government did not act to modernise gaming laws "gambling addiction is going to get away from us," he added. Gambling in the UK is worth more than £63bn a year, according to figures compiled for the industry. Most of the provisions in the Gambling Bill will apply to England, Scotland and Wales, but not Northern Ireland. The Conservatives attacked the government for ignoring the recommendations of the joint scrutiny committee. Shadow Culture Secretary John Whittingdale said: "Instead of adopting the cautious approach which the committee recommended, the government's proposals open the door to a large number of super-casinos being built in our town and city centres while existing smaller UK operators are prevented from competing on an equal basis. There is a real danger that, as it stands, this legislation will increase problem gambling as well as doing damage to the UK gaming industry." 1Xtra: Big-style casinos - good or bad?